I had this conversation with my friend the other day, and it occurred to me that it seems like we are all waiting on something. I have one friend who is waiting to get engaged, hoping it will happen any time now. Then another friend who is engaged, but they haven't set a date yet and she is just patiently waiting for her wedding day. Me on the other hand, I'm waiting for my prince charming. So why do we live our lives waiting? Why does it seem that we are never satisfied with our current situation? Always looking ahead, assuming that the grass is greener up ahead? I would like to suggest that it has something to do with the fact that since the future hasn't happened yet, in our minds it is better than the present. Because in our minds the future is picturesque. Why do we insist on doing this? Why isn't right now good enough? I don't think it's horrible to think that good things lie ahead, but are we living for the future, for things to come? I pray that I don't miss something today because I'm looking forward to tomorrow, and the same for you as well. This has been deep thoughts with kasey...haha! Super Duper: I switched to a new perfume, and I really like it! Super Pooper: I still haven't started that assignment that is due on Friday!! This is a slightly delayed post, but here are a few pics of Brady's 5th birthday party - Pirate theme!! It was super duper fun! I would post more pix, but I left my camera at my sister's house and won't get it back til next week. Bummer, but my other sister sent a few pics, so this will have to tied you over. Yes, we all dressed up! It was hilarious and adorable! Brady, trying to look tough, and Ashlyn being the "Pirate Princess" (as she put it). My precious Blakers. Who knew an 18 month old could be such an adorable pirate? Super Duper: My lovely friend Kristi is in town for the weekend! Well, I'll make this short and sweet, but yesterday Houston was hit by an intense thunder storms. 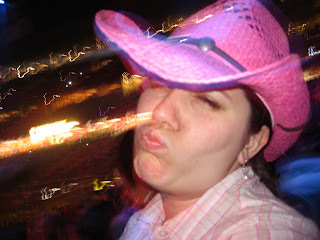 And we were supposed to be going to the Houston Livestock Show & Rodeo to see Rascal Flatts in concert!! While we were praying that the rain would stop, we found out that the lead singer from Flatts had laryngitis and had to cancel!!! WHAT???? Oh, I was so disappointed. So then at this point it was, "Do we really want to go?" In the rain? Without Flatts? Well Jon Nichols, Jack Ingrahm and Clay Walker were replacing Flatts. And if I didn't go last night then I wasn't going to get to have my Rodeo experience at all this year!! It's over on Sunday and I'm headed out of town this afternoon!!! So, anywho, since I'm at work, here are a few pics for your viewing pleasure! While we were waiting for the rain to stop we played Rummikub and took silly pictures (like this). 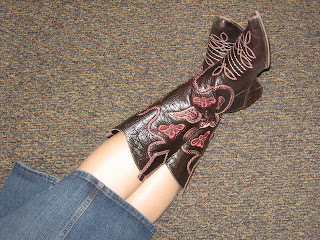 Funny thing, when Rebecca was taking this picture of me, some guy walked by and told his girlfriend, "See, she's woman enough to take a picture with the boot!" 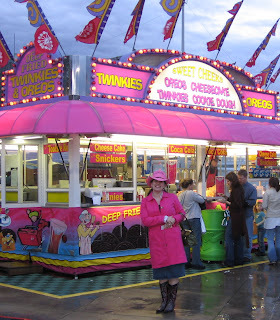 About to purchase what has now become annually traditional, fried oreos!!! In the staduim, watching the calf scramble, my favorite part! Rockin' Out With Clay Walker! Super Duper: headed to Temple today for Brady's 5th birthday party!! Super Pooper: besides the obvious that I didn't get to see Rascal Flatts last night...I guess the fact that Spring Break is over and even though I still had to work this week, it was super quiet around the office, and nice to have a down week, but next week will be back to the usually hustle and bustle! 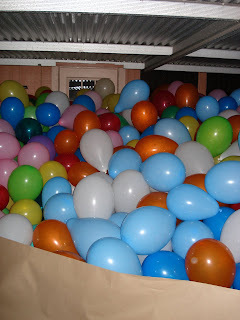 This is an estimated 1500 balloons on the back porch of the newly married Single's Minster at Tallowood. 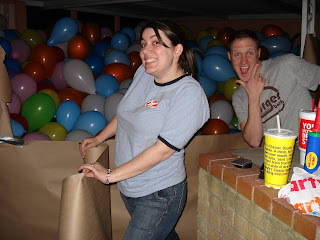 This was early on, when the balloons were only knee deep. Working on the butcher paper wall to keep all the balloons fenced in the porch. 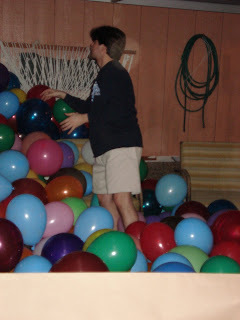 That's an estimated 1500 balloons, piled on their back porch. Yes, that's the back door at the very top! And better yet, the door opens in to the house, so when they open the door, the should come flooding in!!! Fun times, WE LOVE YOU ROB & LYNDA! Super Duper: cleaning a very dirty apartment, not necessarily fun, but worth the end product! take a gander at my "hits" counter. Let me know if you are the 10,000th hit on my blog!!! tonight I was the moderator for a small group of youth for their Wed night gathering. Our topic to discuss was: Regret, Forgiveness & The Road Ahead! We had a rather good, crazy, thought provoking time! 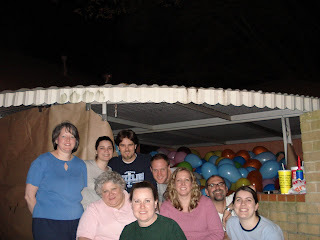 tomorrow a group of us are filling the newly married singles minister's back porch with hundreds (close to 1500) balloons! Friday night I'm having a random group of friends over to my apt for game night! no big plans for Spring Break - but i don't have class next week, woohoo! but I am going to Temple for my nephew's 5th birthday party. It's pirate theme...I need to dress up, any quick, easy costume ideas? my apartment is a DISASTER zone!!! I need a haircut, oil change, car wash, go to the bank, go to the grocery, take clothes to the cleaners and no time to do it! Ok, that's the gist of it. It's bedtime now! Check ya lata! Super Pooper: my whole family is going to be together in Corpus without me this weekend! That's right. 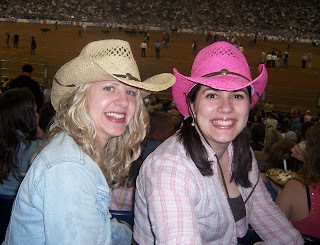 My dear friend Rebecca and I were talking one night about how all our friends were getting married or moving or having babies and how our group of friends was becoming smaller and smaller. As much as we love married people, they don't feel the need to be as social as single people do, it's just a fact. So we decided we would create a new group of friends for ourselves. I know, this sounds ridiculous, but we're going to attempt to do this. Our first gathering is going to be this Friday. We came up with a list of people, young fun singles that we thought would be fun to hang out with. So, as funny as this may sounds, we're hoping this group will start regularly hanging out and just kind of become a group that does stuff together...we'll see. I'll let you know how it works out so that the rest of you out there can learn what to do or what not to do when starting a new group of friends. I know, I know, usually you don't intentionally select a group of people like this. It usually works best if groups form naturally, but the problem is that there are several (not tons, but several) singles that we know, but they never hang out. Our hypothesis is that the only reason these people never hang out is because no one ever plans anything. So we are going to make sure things get planned. We kind of figure, what's the worst that could happen, one or two nights of awkward conversation with a random group of people? I think we can handle that. We'll see how this works. I'll keep you posted. Super Pooper: My friend, Lillian's, grandma passed away on Friday.